Savings bonds were created to finance World War II. Unlike Treasury Bonds, they are not marketable. In 2002, the Treasury Department started changing the savings bond program by lowering interest rates and closing its marketing offices. 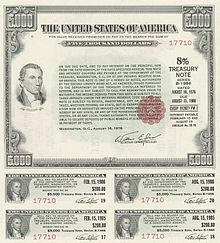 As of January 1, 2012, financial institutions no longer sell paper savings bonds. The annual (calendar year) purchase limit for electronic Series EE and Series I savings bonds is $10,000 for each series. The limit is applied per Social Security Number (SSN) or Taxpayer Identification Number (TIN). For paper Series I Savings Bonds purchased through IRS tax refunds (see below), the purchase limit is $5,000 per SSN, which is in addition to the online purchase limit. Series EE bonds reach maturity (double in value) 20 years from issuance though they continue to earn interest for a total of 30 years. Interest accrues monthly and is paid when the holder cashes the bond. For bonds issued before May 2005 the rate of interest is recomputed every six months at 90% of the average five-year Treasury yield for the preceding six months. Bonds issued in May 2005 or later pay a fixed interest rate for the life of the bond (0.10% in November 2016). At 0.10%, a $100 bond would be worth about $102 just before 20 years, but will be adjusted to the maturity value of $200 at 20 years (giving it an effective rate of 3.5%) then continue to earn the fixed rate for 10 more years. In the space of a decade, interest dropped from well over 5% to 0.7% for new bonds in 2009. 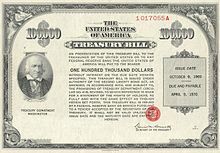 Paper EE bonds, last sold in 2011, were issued with a face value of twice their purchase price, so a $100 bond could be bought for $50, but would not be worth $100 until maturity. 1975 ad for U.S. saving bonds. Series I bonds have a variable yield based on inflation. The interest rate consists of two components: the first is a fixed rate which will remain constant over the life of the bond. The second component is a variable rate reset every six months from the time the bond is purchased based on the current inflation rate. New rates are published on May 1 and November 1 of every year. The fixed rate is determined by the Treasury Department (0.00% in May 2017); the variable component is based on the Consumer Price Index (CPI-U) from a six-month period ending one month prior to the reset time (0.98% in May 2017, reflecting the CPI-U from September to March, published in mid-April, for an effective annual inflation rate of 1.96%). As an example, if someone purchases a bond in February, they will lock in the current fixed rate forever, but the inflation component will be based on the rate published the previous November. In August, six months after the purchase month, the inflation component will now change to the rate that was published in May while the fixed rate remains locked. Interest accrues monthly, in full, on the first day of the month (i.e., a Savings Bond will have the same value on July 1 as on July 31, but on August 1 its value will increase for the August interest accrual). The fixed portion of the rate has varied from as much as 3.6% to 0%. During times of deflation (during part of 2009 and again in 2015), the negative inflation portion can wipe out the return of the fixed portion, but the combined rate cannot go below 0% and the bond will not lose value. Besides being available for purchase online, taxpayers may purchase I-bonds using a portion of their tax refund via IRS Form 8888 Allocation of Refund. Bonds purchased using Form 8888 are issued as paper bonds and mailed to the address listed on the tax return. Taxpayers may purchase bonds for themselves or other persons such as children or grandchildren. The remainder of the taxpayer's refund may be received by direct deposit or check. Series HH bonds have been discontinued. Unlike Series EE and I bonds, they do not increase in value, but pay interest every six months for 20 years. When they are cashed in or mature they are still worth face value. Issuance of Series HH bonds ended August 31, 2004. ^ "Treasury Department Sets Online Savings Bond Annual Purchase Limit at $10,000 per Series". Treasury. January 4, 2012. Retrieved January 30, 2012. ^ "Individual - HH/H Savings Bonds". Treasurydirect.gov. Retrieved March 25, 2010. ^ "Government Will Honor Discontinued HH Bonds". Los Angeles Times. Articles.latimes.com. September 14, 2003. Retrieved March 25, 2010. A zero-coupon bond is a bond where the face value is repaid at the time of maturity. Note that this definition assumes a positive time value of money. It does not make periodic interest payments, or have so-called coupons, hence the term zero-coupon bond. When the bond reaches maturity, its investor receives its par value. 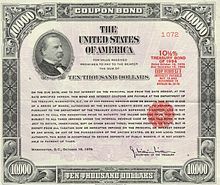 Examples of zero-coupon bonds include U.S. Treasury bills, U.S. savings bonds, long-term zero-coupon bonds, and any type of coupon bond that has been stripped of its coupons. A government bond or sovereign bond is a bond issued by a national government, generally with a promise to pay periodic interest payments and to repay the face value on the maturity date. Government bonds are usually denominated in the country's own currency, in which case the government cannot be forced to default, although it may choose to do so. If a government is close to default on its debt the media often refer to this as a sovereign debt crisis. In finance, the yield on a security is the amount of cash that returns to the owners of the security, in the form of interest or dividends received from it. Normally, it does not include the price variations, distinguishing it from the total return. Yield applies to various stated rates of return on stocks, fixed income instruments, and some other investment type insurance products. In finance, the yield curve is a curve showing several yields or interest rates across different contract lengths for a similar debt contract. The curve shows the relation between the interest rate and the time to maturity, known as the "term", of the debt for a given borrower in a given currency. For example, the U.S. dollar interest rates paid on U.S. Treasury securities for various maturities are closely watched by many traders, and are commonly plotted on a graph such as the one on the right which is informally called "the yield curve". More formal mathematical descriptions of this relation are often called the term structure of interest rates. Fixed income refers to any type of investment under which the borrower or issuer is obliged to make payments of a fixed amount on a fixed schedule. For example, the borrower may have to pay interest at a fixed rate once a year, and to repay the principal amount on maturity. Fixed-income securities can be contrasted with equity securities – often referred to as stocks and shares – that create no obligation to pay dividends or any other form of income. A mortgage-backed security (MBS) is a type of asset-backed security which is secured by a mortgage or collection of mortgages. The mortgages are sold to a group of individuals that securitizes, or packages, the loans together into a security that investors can buy. The mortgages of a MBS may be residential or commercial, depending on whether it is an Agency MBS or a Non-Agency MBS; in the United States they may be issued by structures set up by government-sponsored enterprises like Fannie Mae or Freddie Mac, or they can be "private-label", issued by structures set up by investment banks. The structure of the MBS may be known as "pass-through", where the interest and principal payments from the borrower or homebuyer pass through it to the MBS holder, or it may be more complex, made up of a pool of other MBSs. Other types of MBS include collateralized mortgage obligations and collateralized debt obligations (CDOs). Daily inflation-indexed bonds are bonds where the principal is indexed to inflation or deflation on a daily basis in terms of the official Daily CPI or monetized daily indexed unit of account like the Unidad de Fomento in Chile and the Real Value unit of Colombia. They are thus designed to hedge the inflation risk of a bond. The first known inflation-indexed bond was issued by the Massachusetts Bay Company in 1780. The market has grown dramatically since the British government began issuing inflation-linked Gilts in 1981. As of 2008, government-issued inflation-linked bonds comprise over $1.5 trillion of the international debt market. 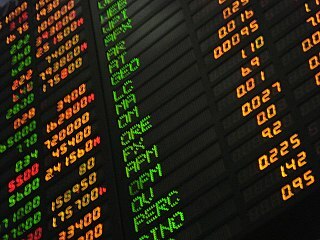 The inflation-linked market primarily consists of sovereign bonds, with privately issued inflation-linked bonds constituting a small portion of the market. The bond market is a financial market where participants can issue new debt, known as the primary market, or buy and sell debt securities, known as the secondary market. This is usually in the form of bonds, but it may include notes, bills, and so on. The Bureau of the Public Debt was an agency within the Fiscal Service of the United States Department of the Treasury. United States Secretary of the Treasury Timothy Geithner directed the Bureau be combined with the Financial Management Service into the single Bureau of the Fiscal Service in 2012. The real interest rate is the rate of interest an investor, saver or lender receives after allowing for inflation. It can be described more formally by the Fisher equation, which states that the real interest rate is approximately the nominal interest rate minus the inflation rate. United States savings bonds are debt securities issued by the U.S. Department of the Treasury to help pay for the U.S. government's borrowing needs. U.S. savings bonds are considered one of the safest investments because they are backed by the full faith and credit of the U.S. government.